Saracens Women started the defence of their Premier 15s title with a six-try 38-5 victory at Firwood Waterloo Ladies. 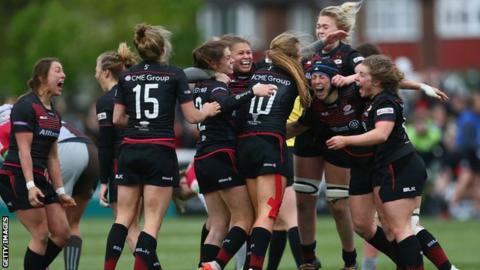 Sarries, under new head coach Alex Austerberry, opened the scoring through a catch and drive that was finished by England international Poppy Cleall and held a 19-0 advantage at the break. Katharine Evans and Bryony Cleall, the younger of the Cleall twins, extended their lead before Waterloo scored their only points of the match in the latter stages. The reigning champions are at home in round two to Worcester Valkyries, who came up just short to lose 27-24 to Darlington Mowden Park Sharks at the Northern Echo Arena in their season opener. Roy Davies' side, who were targeting their first Premier 15s victory after going winless last season, led 12-8 at the interval but found themselves 27-19 down going into the final 10 minutes. Carys Cox's 78th-minute try set up an exciting finish but they were unable to complete their comeback. Bristol Bears Women were unable to replicate the victorious start to the new season that their men's side delivered against Bath last weekend as they went down 32-17 at home to one of last season's semi-finalists Wasps FC Ladies. New signing Claire Molloy scored a brace of tries for Wasps, while England tight-head Sarah Bern, a key returnee into Bristol Bears Women's set-up, was one of their try-scorers. Last season's runners-up, Harlequins Ladies began their campaign on the road and travelled home with the points after a 38-24 win at Gloucester-Hartpury Women's RFC. Rachael Burford's try handed Harlequins Ladies a 19-14 lead just before the change of ends, an advantage they never relinquished. Meanwhile, there was also victory for Loughborough Lightning, who began their season with a hard-fought 22-19 victory over Richmond FC. Lightning's most significant summer signing Katy Daley-Mclean, who captained England to World Cup victory in 2014, used her accurate boot to help them storm into a 17-0 half-time lead. The home side then moved 22-5 in front before their indiscipline and yellow cards reduced them to 11 players in the final 10 minutes. Richmond scored twice through a penalty try and a close-range effort from Libby Povey but the home side managed to see out the game. Inspired to try rugby union? Find out how to get into rugby union with our special guide.